August 3, 2016 by Emily Brees 10 Comments - This post may contain affiliate links. 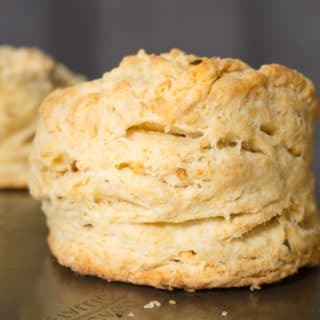 If you love sweet and spicy these Spicy Sriracha Buttermilk Biscuits are just the right biscuit for you! 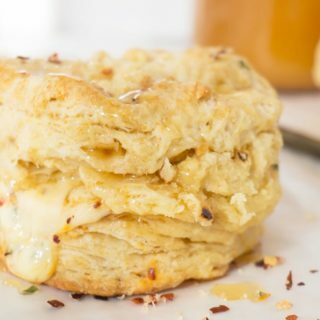 Great as a breakfast sandwich or on their own slathered with a bit of honey and butter. With friends coming into town soon, I gave myself permission to experiment and splurge on some buttermilk biscuits. This time I went sweet and spicy using Rodelle Asian Style Sriracha Seasoning! Most of us have used sriracha sauce in squeeze bottle form. 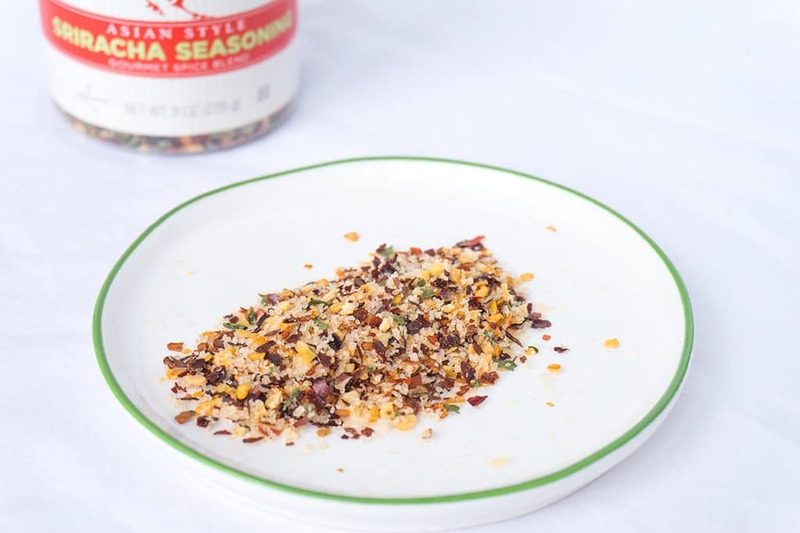 This seasoning option is great because it does not add any moisture or effect the color of baked goods. 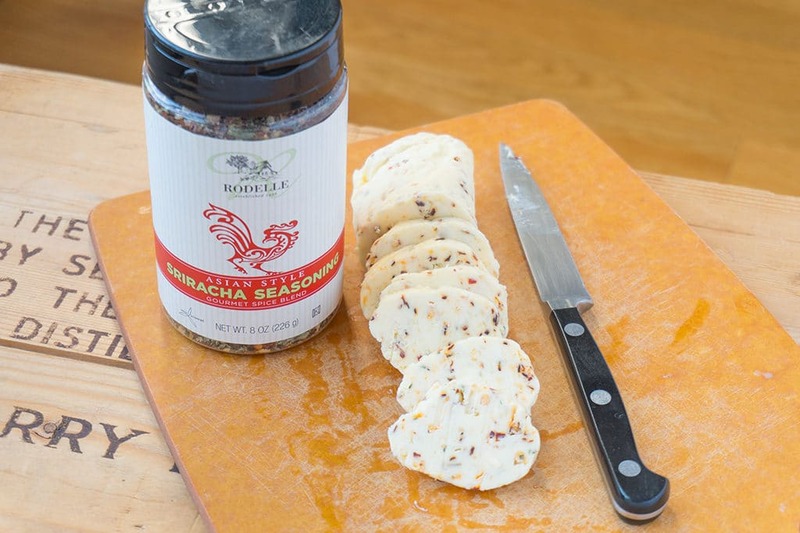 I prefer Rodelle’s seasoning blend because it’s not ground into a fine texture. See all the individual spices? They create visually appealing biscuits = even better tasting biscuits! 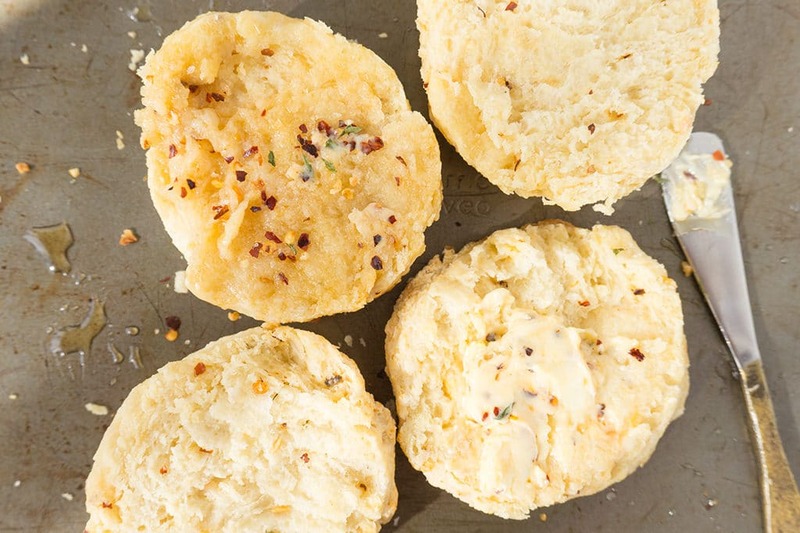 To create these Spicy Sriracha Buttermilk Biscuits, first make a compound butter. Sounds fancy, right? Mix any combination of seasoning with room temperature butter. Place it on wax paper and roll it into a log. **Cinnamon-sugar compound butter is on my menu for next time. 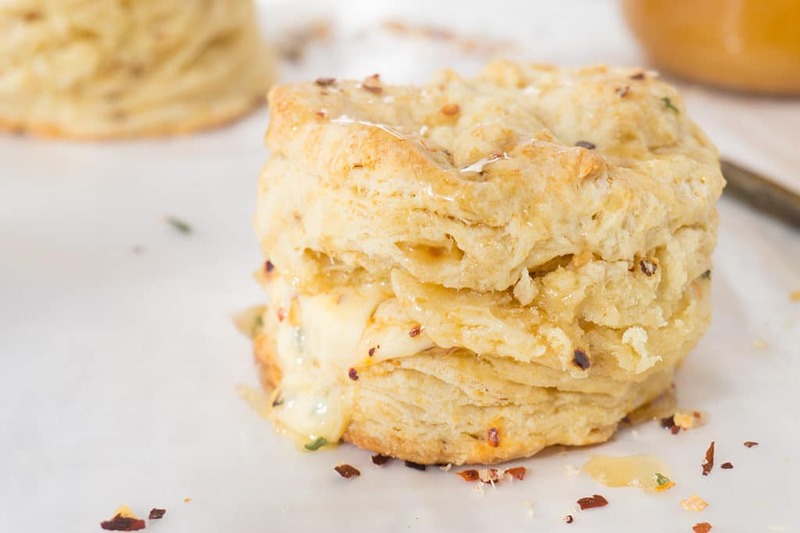 With a whole batch of these biscuits ready to bake straight from the freezer, my time can be spent sipping coffee and visiting with my friends instead of spending too much time in the kitchen. I hope they like biscuits! Slather these with raw honey and sprinkle with extra Sriracha seasoning. These are going to pretty much blow your mind. I guess I’ll have to make more! 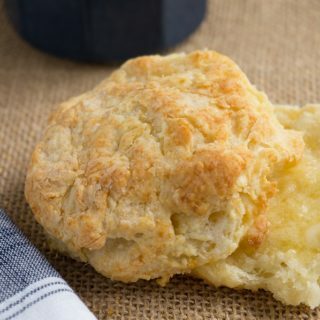 For great tips on high rising biscuit making fun – check out this post. First 20 Enrollments are Free with this LINK! 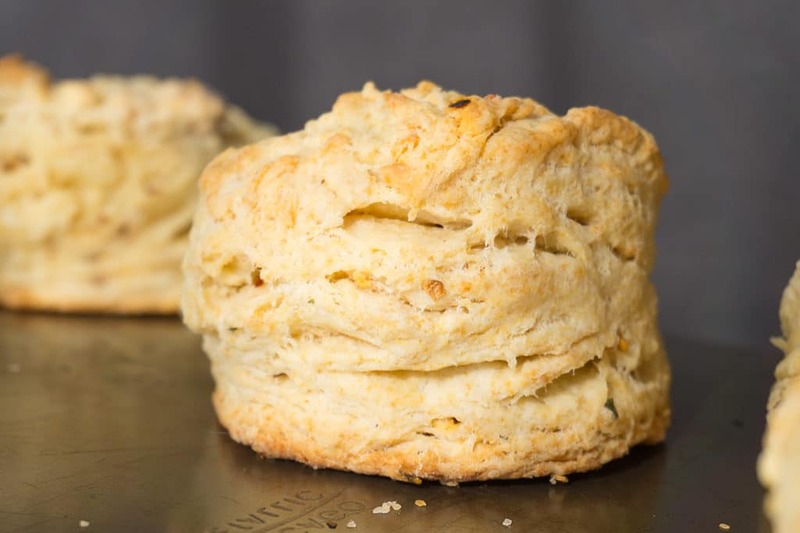 Sriracha laced compound butter is mixed into this traditional buttermilk biscuit recipe. Slather on some honey for a sweet and spicy breakfast delight. toppings: honey butter, jam, eggs, cheese, bacon, spinach. Bring butter to room temp. Mix in salt and sriracha seasoning. Blend well. Place on parchment or wax paper. Shape and roll to form a cylindrical log using the wax paper. Refrigerate until very cold or freeze. 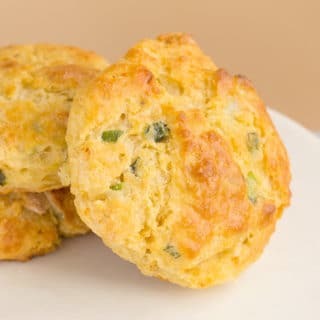 When ready to use, slice into small pats of butter, reserving any extra you made for spreading onto finished biscuits. Preheat the oven to 400° and position racks in the upper and lower thirds. Line your baking sheet with parchment paper. In a large bowl, whisk the flour, salt, baking powder and baking soda. Add in compound butter. Loosely toss it in the flour until coated and then use your fingers or a pastry blender to cut in the butter until it is the size of peas. 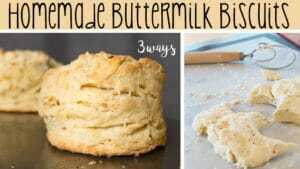 Add the buttermilk and stir using a wooden spoon until a shaggy dough forms. Place the shaggy dough on a floured surface and knead until it comes together. Keeping in mind that you don't want to overwork the dough and it's ok for it to remain a bit shaggy and dry. Softly press out the dough to desired thickness - I go for 2". Using a round biscuit cutter, stamp out the biscuits, combining the scraps to make more biscuits. Place close together, almost touching on baking sheet. Bake for about 20 minutes, until golden and lofty. Let them cool for a minute or two and slice for sandwiches or honey, sriracha butter and jam. *adding honey with an additional sprinkle of sriracha seasoning is mind blowing. 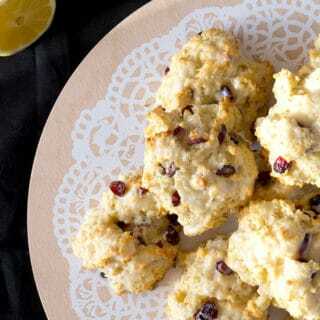 If you freeze the biscuits, no need to thaw, just bake them an extra five minutes or so! Leave a comment and follow me on Instagram, Twitter, Facebook, &amp; Pinterest! You’ve just blown my mind- I didn’t even know sriracha CAME in a dry form! And oh man do I love biscuits!!! Your biscuits are gorgeous! I’m craving them right now. I must have this seasoning in my pantry, my guys will be all over it!!!! It’s definitely a great seasoning to have on hand! Oh-Ma-Gawd! Those biscuits are absolutely stunning! I love the way you made a compound butter before you started. Why have I never thought to do that??? Genius! These biscuits look delicious. I am always up for experimenting with new takes on old classics. Being a good cook is all about being prepared, so that you can make delicious recipes like this. Nice job. I’m totally drooling! Not sure if I’m loving the butter compound more or the biscuits! Got to try this! It’s pretty darn delicious! I love them with honey – spicy and sweet! So good! Hope you try it!